SUPER SUNDAY SALE – 50% Off, Today Only! This retro wooden case is uniquely beautiful! Covered in rich brown tones and a funky floral and flourish pattern, it’s just as cute as it is functional! The rounded horseshoe shape gives a very distinctive style, and there’s lots of room on the inside for storage. 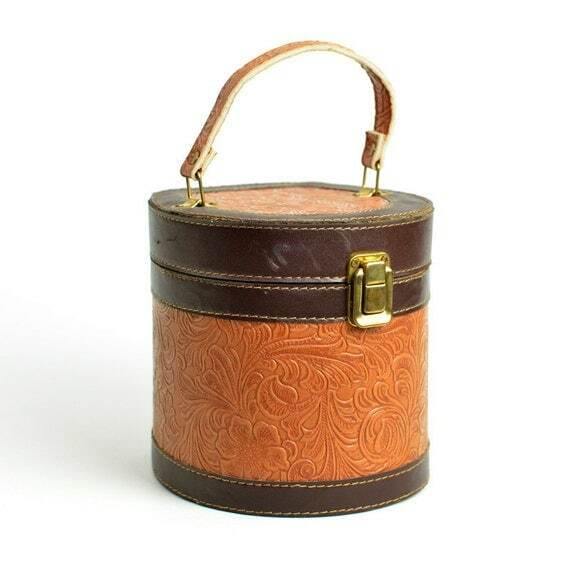 A great vintage purse accessory, or perhaps a rustic addition to your southwest home decor! In good vintage condition, this purse has a few scuffs here and there on the exterior. On the back of the case between the buckles it seems the leather trim is fraying out a bit at the stitch (see fourth photo). This issue could easily be solved with a couple dots of glue, I’d imagine. The latching buckle moves fluidly and functions perfectly. The attached top handle is tight and secure. All hardware is metal, and slightly tarnished as expected of age. The interior of the box is dark stained wood. I have found no cracks or damage to any of the wood, other than some slight shelf wear on the bottom (last photo). The interior of the purse is clean and actually looks like it has never been used. The wood is quite thin, making the purse nicely lightweight. The hinges on back work just fine, and are tight enough that the lid will hold itself up when fully opened. This case is covered in what appears to be hand-tooled leather (based on the scent and feel). This outer shell is glued to the wood, as you can see from the seam on the back. The style of design is very similar to the popular souvenir creations of the 1950’s and ’60’s from the southwestern states and Mexico. However, it’s not marked with a manufacturer, so the exact age and origin are not for certain. The case itself (not including the handle) measures 6″ tall, 6″ across at the widest. Visit One Rusty Nail today!